Cavalier with Plume Adult Hat.Includes: One Cavalier with Plume Adult Hat. Available Size: One Size Fits Most Adults. *Costume and Accessories Not Included. Sold Separately. Deluxe felt extra tall top hat. A Coachman hat is also called a Dickens Top Hat. Perfect for an Abraham Lincoln top hat. 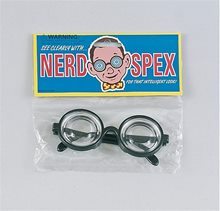 Nerd Specs These Nerd Specs are a classic visual gag accessory, but they still never get old - especially when you use it in unexpected ways! Sure they're great for any geeky getup, but they also bring a whimsical touch to monster costumes, political outfits, and more! Hippie Glasses (Assortment).Includes: One Pair of Hippie Glasses. Available Size: One Size Fits Most Adults and Teens. *Costume and Accessories Not Included. Sold Separately. Care Instructions: Wipe clean with damp cloth. Line dry. Do not wash. Do not bleach. Do not iron. Do not dry clean.Everyone needs a pair of groovy glasses, man. Accessorize your 60's costume and be seen on Halloween. Available in assorted colors. *NOTE: There is no color/style option for this item due to item availability. John Lennon Purple Glasses.Includes: Includes one pair of gold framed glasses with purple to yellow fade rounded lenses.Size: Fits adults and kids 12 and up.Material: Metal hinges.Features: UV 400 protection.Throw on this throw back style and set your sails to circa 1969. 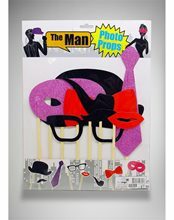 This funky style is a great addition to any retro costume. With its high quality metal frames and hinges, these glasses are sure to last until 2069. Aviator Sunglasses.Includes: One Pair of Aviator Sunglasses. 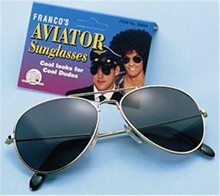 *Costume, Necklace and Wig Not Included.Complete your groovy 70's costume with these aviator sunglasses. Perfect for police costumes too! Harry Potter Glasses; These matte black, plastic frames will earn you the new nickname of Harry. 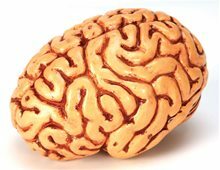 Just add the lightening bolt scar to your forehead and you’ll be all set. Antiqued gold logo adorns each temple for an authentic look. 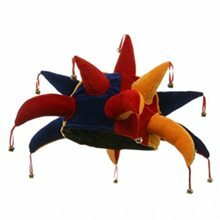 Jester with Point Bells Hat.Includes: One Jester with Point Bells Hat. Available Size: One Size Fits Most Adults. *Costume and Accessories Not Included. Sold Separately.One size fits most. This hat makes a great accessory for Halloween, costume parties or other dress-up events. Spanish Hat With Red Ball,Ole! Ready to dance to a passionate flamenco rhythm this Halloween? Need something scintillating to complete your matador masquerade? 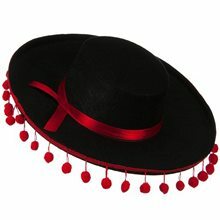 Then this Felt Spanish Hat is just what you're looking for!This enticing apparel features a black felt, Spanish hat with a red band. It also has red ball fringes attached around the rim to bring out the Latin lover in you this Halloween!